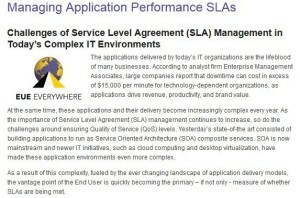 SLA is an agreement, usually between a customer, and a business associate. The process outlines the predicted time it will take to fulfil a business proposal, or a promise of service. It allows you to observe every element of your company, discovering the promotional aspects and the flaws before you attempt to unleash the program. It shows you the outline of a proposal in the form of “Levels”, this can be used to display the service, efficiency, and operation of the company. SLA Management allows you to streamline your assets, it focuses on providing your customers with minimal time wastage, whilst saving you money in the process. It reduces the chances of company downtime, which can cause, in extreme circumstances in the excess of thousands of dollars. Every year, it becomes harder and harder for many businesses to deliver the promises they made prior, thus complicating the service and rendering your business inefficient. SLA software allows you to broaden the horizon of your investment, by showing you exactly what your service is, and how well you are delivering on the many aspects involved. It can be a lifesaver for many businesses, and with an SLA management software program you can excel past that of your competitors.